Three intriguing women, Three Imperfect men, Three fascinating stories! Real estate agent Nikki Desai has a rule of not dating her clients. When she hosts an open house on a cold Dallas afternoon, she didn't know what was in store for her. Much like Dallas' unexpected weather, Karan Malhotra, a business consultant, walks into her life and challenges every belief she holds close to her heart. Karan manages to cajole Nikki, but is she making a mistake in breaking her rule by dating Karan? Arranged marriage - where love happens after marriage or does it? Ishan, a NRI from Dallas, Texas visits his home country, India and gets entangled in his parents' plan to get him married. Sonali is a simple girl from a small town called Meerut and has no desire to leave India. However, she reluctantly agrees to marry Ishan. But when she settles with him in a foreign country, she is completely lost and homesick. Will Sonali find love in a conventionally arranged marriage? Maya Sarin is sensuous and enterprising. She runs a dance school in the suburb of Dallas. Tahir Ali is an aspiring author who owns a Mediterranean restaurant in the area. When his regular dancer bails out on him, he rushes in Maya as a replacement. Maya is the inspiration that he had been longing for; she feeds his creative soul. Do they have any future together? Explore their passion and intrigue in Love Tango. Aditi Chopra was born in India and now lives in Texas with her family. She writes NRI (Non Resident Indian) fiction and non-fiction books. Aditi has an engineering background but she has found her creative bone in fiction writing. Her stories range from Contemporary Romance to Women's Fiction. 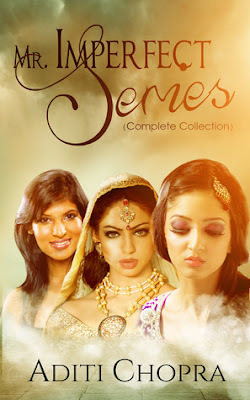 You might see a glimpse of Bollywood in her stories and will definitely enjoy the emotional ride. Aditi is also a member of Women's Fiction Writers Association. 1. Which of the three books was the easiest to write, and which the most difficult? Why? That’s a great question. Now that I think about it, ARRANGED MARRIAGE was more challenging to write than the other two stories. The subject was intriguing yet unknown to me since my marriage was not arranged. I had struggled a bit with the concept to be able to bring out the right emotion into the story. I would say LOVE TANGO was easier to write since the heroine of the story runs a dance school. I’ve always enjoyed dancing, so I could relate to her quite a bit. 2. What do you like most about writing romance novels? You know, I read a ton of Mills & Boon novels in my teen years, but of course, at that time, I didn’t know why I enjoyed reading them so much. I think that the inherent positivity of a romance novel is what I like. The feel good factor and the happy ending, don’t we all love that? 3. Do you think there is anything that sets Indian romance novels apart from the international / Western ones? Yes, definitely. There are a variety of things that set the Indian romance novels apart from western ones such as the culture, family traditions, colorfulness that occurs in everyday Indian life and how the hero and heroine think about romance. All of these things shape the characters and as we all know, characters are the lifeline of stories. It’s the characters that the readers relate to the most. I believe initially I started writing for the thrill of challenging myself. Being an engineer, I wanted to see if I could actually write fiction or not. I had to retrain my brain and it was an exhilarating experience. I like challenges and often get bored of the same old routine. Now I find creative satisfaction in writing. 5. The cover looks gorgeous! Do you make your own book covers? Thanks, I’m glad that you liked the cover. As much as I would like to, I can’t design covers at all, I leave that for others to do. I do think covers are very important, especially for fiction books. That’s the first thing readers see and get attracted to. Wishing the author great success! That was in insightful interview! Wishing Aditi a great success with her book! Thanks Devika for an awesome interview!